ALEX: Too many people misunderstand the nature of this subscription model of software use. it’s not anything new, really, we’re just formalizing an already existing relationship. CUSTOMER: Formalizing? How can you say this “relationship” already exists? ALEX: We make software, you buy software. We make new software, you upgrade your software. 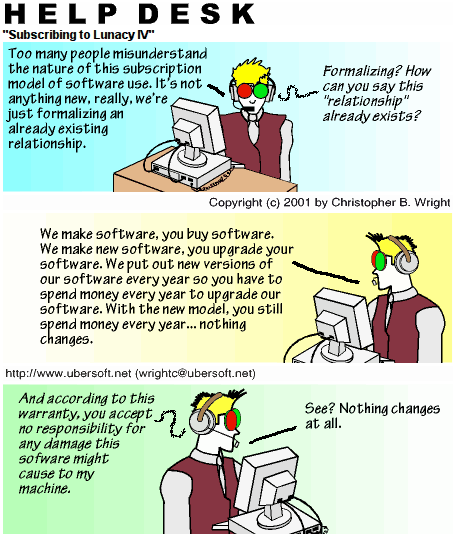 We put out new versions of our software every year so you have to spend money every year to upgrade our software. With the model, you still spend money every year… nothing changes. CUSTOMER: And according to this warranty, you accept no responsibility for any damage this software might cause to my machine. ALEX: See? Nothing changes at all.